Inglenook is located within 10 minutes walk of Ludlow town centre. The property is signposted from Livesey Road - it can't be missed, opposite the horse chestnut tree which grows in the middle of the road. If using Sat Nav to find the property, we recommend that you search for Livesey Road, as the postcode does not lead you directly to Inglenook. 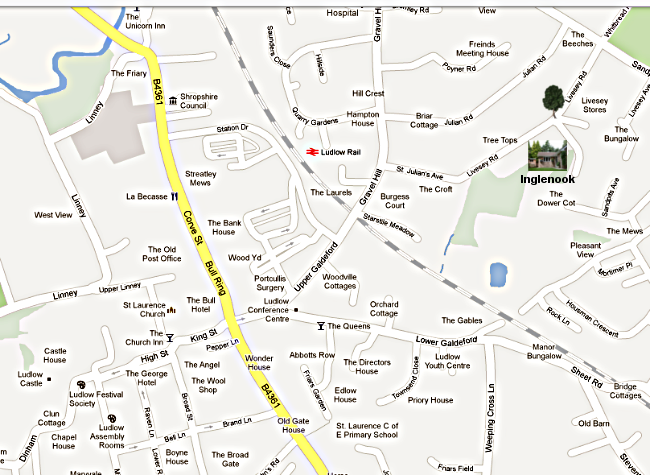 The map below shows the location of Livesey Road. When travelling from the north on the A49 (Shrewsbury), take the B3461 signposted to Ludlow. Follow this road past Ludlow Leisure Centre towards the town centre. At the traffic lights next to Tesco turn left. Follow the road up the hill past Ludlow Railway Station and turn left at the traffic lights. Take the first road on the right signposted St Julians Avenue leading to Livesey Road. Follow this road up the hill and around the bend. Turn right at the horse chestnut tree and follow signs to Inglenook. When travelling from the south on the A49 (Hereford), immediately after you have passed Ludlow Travelodge on the left, you will reach a roundabout. Take the first left onto The Sheet. Follow this road under the railway bridge and past the Co-op supermarket. Go straight over the traffic lights. Take the first road on the right signposted St Julians Avenue leading to Livesey Road. Follow this road up the hill and around the bend. Turn right at the horse chestnut tree and follow signs to Inglenook. Ludlow is located on the Shrewsbury to Hereford railway line. There are regular and direct trains to Manchester and Cardiff, either of which can be reached in less than 2 hours. Contact Traveline (www.travelinemidlands.co.uk), The Trainline (www.thetrainline.com) or National Rail Enquiries (www.nationalrail.co.uk) for timetable information. The majority of trains carry bicycles by prior arrangement. To reach Inglenook by foot from the railway station, exit the railway station - Tesco will be facing you. Follow the road up the hill and turn left at the traffic lights. Take the first road on the right signposted St Julians Avenue leading to Livesey Road. Follow this road up the hill and around the bend. Turn right at the horse chestnut tree and follow signs to Inglenook. There are many regular bus services connecting Ludlow to nearby centres including Shrewsbury, Telford, Kidderminster, Hereford, Worcester etc. Information on bus services can be found by contacting the Traveline (www.travelinemidlands.co.uk).